IAP, or In App Purchasing is the practice of selling items within a game, think things like the ability to purchase more game gold to buy resources, or new and more powerful weaponry. IAP isn't new either, it's been around for a long time, its been the basis for whole industries (see Facebook/Zynga). It's always been around mobile gaming too, but more recently it's started to hit the press, and not for any good reasons either. It all started with the general outcry (and a lot of disgust), at Madfinger and their release of Dead Trigger last summer. Normally we associate IAP with free games, but not here. Madfinger charged around 69p/$1 for their game, but it was impossibly hard without then spending further money within the game, so hard in fact, it was virtually unplayable. They essentially charged you up front for a game, then forced you to spend money in-game if you wanted to keep playing. That upset a lot of people (me included), and Madfinger eventually removed the initial cost, blaming piracy for it being there in the first place. A very convenient story, and also one I didn't believe at the time (and still don't). Offer a game for free (or low initial price). Offer additions to add more fun to the game for a price. Users purchase in-game to add fun, or make it easier. IAP can actually be a good business model, for both developers and customers. Developers need to get paid, game development isn't easy. It's hard to create a coherent idea that people will enjoy, its hard to write that game (arguably harder than creating apps), and when you counter in the fact that a lot of game developers are individuals or small teams, the above is compounded.It's sort of like you going out and completing your day job, then at the end of the month your pay packet coming in at 10% of what you thought it should. Making people pay to get the game, then pay to gain extra's can be done well. But I haven't seen a single example of this. 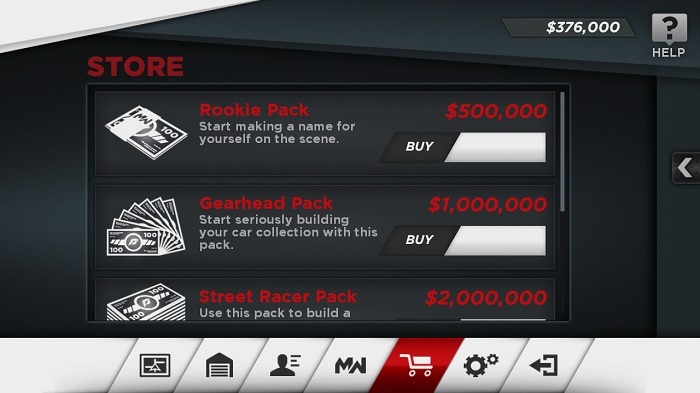 What I have seen is an initial cost that matches the price of other games that don't have any IAP! Then the IAP items tend to be integral to the game, rather than superfluous items designed to enhance the fun. Why on earth would I want to buy your game knowing I'm going to have to keep on spending if I want to keep playing? IAP is about enhancing the game, it shouldn't be used as another form of difficulty (or at least, not so much). A lot of games get this totally wrong. A free game that contains IAP should still be playable without having to purchase anything! I have lost count of the number of games I've played where I get a 1/3 through and the game suddenly becomes absolutely unplayable. It's as if the difficulty increased ten-fold for absolutely no reason. Well, I say no reason, the reason is to make me spend money. This isn't the IAP model, this is the freemium model.... Or in other words, the wrong model. Ok, so I know your game contains IAP because I read the description before I downloaded it, I also saw the "Shop" icon subtly displayed in the centre of the screen when I opened it up, oh yeah, I also noticed the big pop-up before the 1st level displayed asking me to buy some power-ups, and I nearly forgot, the full-screen store window suggesting I increase my number of gold coins by 10,000 for only Â£3.99. In other words, I get it. I know, now leave me alone to actually play your game, see if it's any good then decide if I want to give you my money. Games should be created with the the goal of providing a fun experience for the player. But when IAP is involved, it feels like that almost becomes a secondary item. 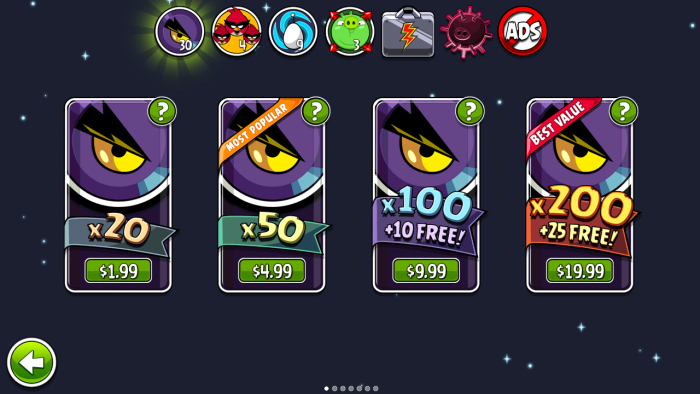 Games that are designed for IAP are generally just not as fun to play.. A pretty good and recent example of this is Angry Birds. This game is massive right now, but it started out with humble beginnings. It was free (on android at least) and the ads were non-intrusive. Yet if you go and pick up Angry Bids Space right now, you can barely breathe due to all the IAP elements literally thrown in your face. For people who just want to play the game, this is becoming a serious issue in the fun aspect. I see elements of the above all the time. It's so bad that I've pretty much given up on the IAP model all together. If I see a free (or paid for the matter) game, I'm very suspicious of it until I actually see proof it wont try to get money from me. If I do see it has IAP, then I'm always looking out to see i the game will still allow me to play it well enough without me having to buy power ups or game money. All of this actually detracts from what I should be doing, enjoying the actual game...! The other problem with the IAP model is how well it transfers to other devices. 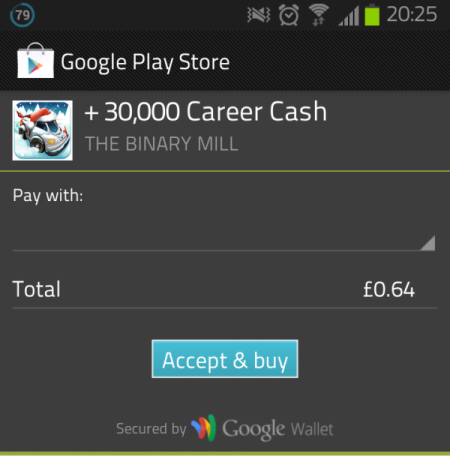 When you purchase something from the android Play Store, you own it. That game is available on every device you own. But how about if you make an in-app purchase on one device. Is that then available on the next device you own? Possibly, possibly not.. The games don't offer any advice on this matter either, which makes me think they are trying to skirt the issue, which makes me think I'll probably have to make that same purchase again next time. Maybe I'm being too un-trusting? But when I hit level 5 and basically couldn't proceed as it was too hard, you lost any trust I might have had. One of the arguments for IAP is that it helps developers get paid in our world that is overrun with piracy. App piracy is something I hate, I've already explained earlier why you should spend the 59p or $1 a game asks of you before you play it (and to prove it, I recently calculated that I've spent over Â£250 on apps in the past 2 years). I'd like to offer a new argument, IAP actually promotes piracy. Hear me out. There are lots of negatives about IAP, these are compounded by developers who get the model completely wrong. This could make users actually look for the pirated version of the game instead. A pirated game that may have the link to the store replaced with freebies, or removed altogether. People who might have actually paid the $1 to buy the game can play freely now are pushed to the pirated version of your free game because you so royally screwed up (just a thought, but who knows). IAP to me right now is the equivalent of a big sign telling me to be wary at the least, and to stay completely clear at the most. This is from a guy who loves trying new apps and games, who spends a lot of money buying apps and games, but who is essentially tired ofÂ beingÂ disappointed so much. The model can work, it just needs t be treated with respect by developers and implemented for the benefit of everyone. That way we can all win. Us consumers get to play great games without feeling cheated, and developers get the compensation they deserve for providing us with a great experience. Get this right and IAP could stop being the dirty word it is right now, and be something we can look forward to seeing in new games.